Hartford pastors first assumed spiritual responsibility of the Poquonock section of Windsor, and Father John Brady celebrated the first Mass at the Conroy home in 1848. In the fall of 1848, Poquonock passed to the care of New Britain priests. In 1852, St. Mary Church, Windsor Locks, assumed charge of Poquonock. Father James Smyth rented Franklin Hall, a former Congregational meetinghouse, for Sunday Masses. At some point prior to 1886, the hall was purchased, relocated to Kearney Street and designated Holy Name Hall. The Poquonock Catholic enclave soon desired a larger church for their growing community. On January 30, 1887, Bishop Lawrence S. McMahon dedicated St. Joseph Church. In August 1892, St. Joseph was made an independent parish, with Father John Fleming named first pastor. From 1852 to 1892, the section of Windsor now encompassed by St. Gabriel parish was the responsibility of St. Mary, Windsor Locks. In 1853, Father James Smyth offered the area’s first Mass at the home of John Hickey. On November 1, 1865, Father Smyth purchased an Episcopal church named for St. Gabriel, a small frame structure directly north behind the present day church on Windsor Avenue. In 1892, St. Gabriel passed to the jurisdiction of St. Joseph parish, Poquonock. On May 16, 1915, the cornerstone of a new St. Gabriel was blessed by St. Joseph pastor Father John J. Fitzgerald. On May 14, 1916, Bishop John J. Nilan dedicated the church. The prelate raised St. Gabriel to parish status in 1921. Father John F. Quinn was appointed first residing pastor. In the spring of 1956 Father Quinn bought three former public school buildings on Bloomfield Avenue from the Town of Windsor. In September 1956, St. Gabriel School opened in the purchased buildings staffed by the Felician Sisters. In 1985, the Felician Sisters left the parish and were succeeded by the Sisters of St. Joseph. On June 29, 2017, by decree of Archbishop Leonard P. Blair of the Archdiocese of Hartford, Saint Joseph Parish and Saint Gabriel Parish merged to become Saint Damien of Molokai Parish, under Father John P. Melnick’s pastorship. 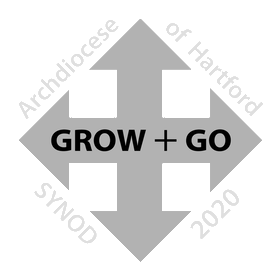 Supporting the spiritual needs of all Catholics in the town of Windsor, the new parish’s mission is to serve Jesus Christ by loving God and each other, to spread the Good News and to make new disciples in our community. It is the vision of Saint Damien of Molokai Parish to unify, awaken and energize the faithful and make our celebration of the Eucharist an irresistible expression of welcome, faith and love.